My husband doesn't really enjoy soup, especially in the summer. I think soup is delicious anytime of year, but I try to stay away from it in the hot summer months. When school starts, for some reason I feel like it should start to cool down outside. But, here in Georgia, it doesn't really work out that way. It is still in the 90's during the day. It's wierd. For me, summer and school don't go together. Besides all that- I saw this cute soup in a magazine I have had for years and decided it would be a fun one to try on a night when my husband wasn't home for dinner. Nothing too complicated at all going on here. My kids helped me make the croutons and were nibbling on them before we sat down to eat. 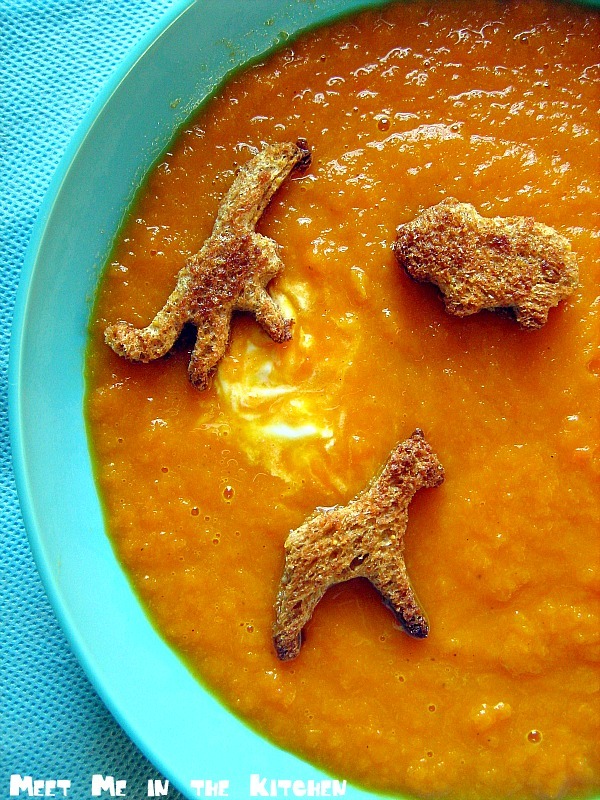 They tasted really good in the soup. This was a yummy tasting soup with lots of flavor. My kids and I loved it. My husband didn't realize that he ate the leftovers because I turned them into pasta sauce. Nothing compares to making 2 dinners out of 1! 1. Melt butter in a large saucepan over medium-low heat. Add leek; cook, stirring occasionally, until translucent, about 5 minutes. Add carrots, broth, and a pinch of nutmeg; bring to a boil over medium high. Reduce heat to medium-low; cover, and simmer until carrots are tender, about 30 minutes. Let cool slightly. 2. Meanwhile, preheat oven to 375 degrees F. Cut out bread using small animal shaped cookie cutters; transfer to a baking sheet. Brush both sides of bread with oil. Bake, turning croutons, halfway through, until golden brown, about 9 minutes. 3. 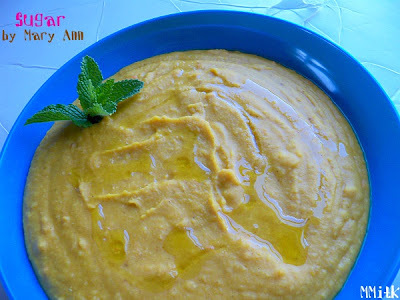 Working in batches, transfer carrot-broth mixture to a blender or food processor; puree until very smooth. Return to saucepan; season soup with salt and pepper. Serve in shallow bowls. Spoon greek yogurt over top; swirl into soup. Top with animal croutons. My daughter requested cinnamon rolls for breakfast on the first day of school. 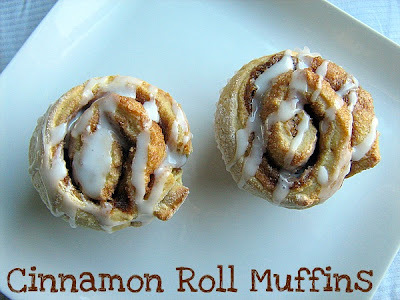 For some reason, when it comes to cinnamon rolls, I am always looking for some sort of shortcut. A few years ago, I found these cinnamon biscuits and they were fabulous. I still make them, but decided to find something new for this year. 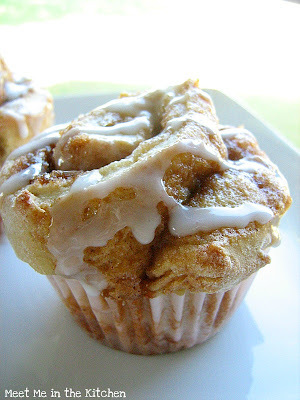 I did some sort of search and found these cinnamon roll muffins. They were perfect! The process is easy. Mix up the dough, roll it out, spread the filling, roll it up, slice, bake and serve! I love that the dough uses buttermilk because I always have low-fat buttermilk in my fridge. These were such a fun way to start the first day of school and everyone loved them! I saw these cupcakes and thought they would be so much fun to make for a gathering where there were going to be lots of little kids. 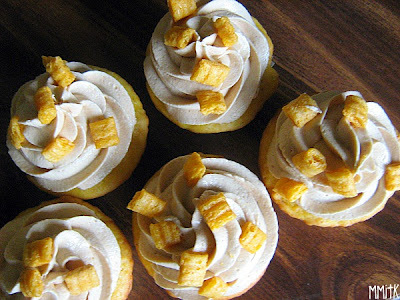 What could be better than combining Cap'n Crunch cereal and PB? 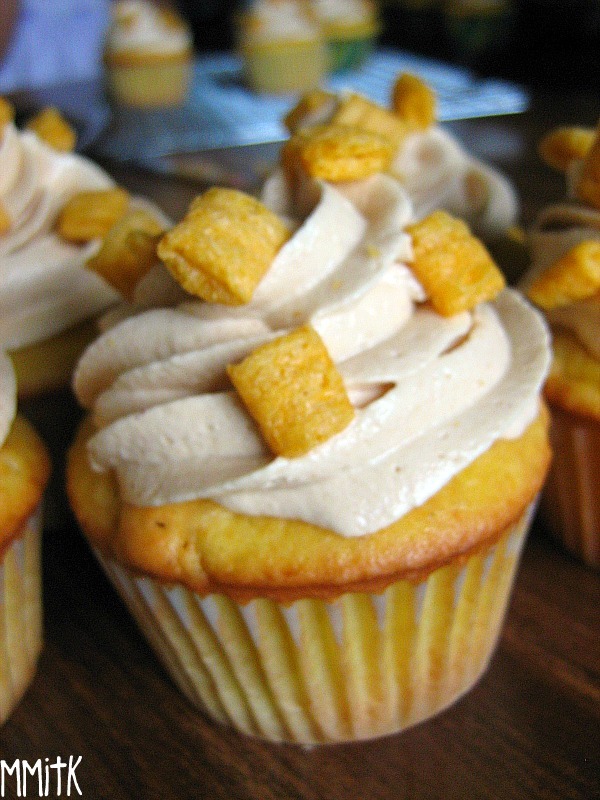 Not to mention some fluffy marshmallow stuff and then turning it all into a cute cupcakes. I don't ever use cake mix nor do I have it on hand (mostly because I enjoy make cake from scratch), but for this one, I went ahead and used a mix because that is what the recipe called for. This was a winning combination and everyone really thought they tasted great. Definite crowd pleaser! Once again, I present a bad photo, but this cake was delish! My friend and her 5 children spent the night with us and she had purchased some peaches from a fruit stand. We decided to make this cake for breakfast and it was really good. It is a basic coffeecake batter and I used buttermilk instead of sour cream. 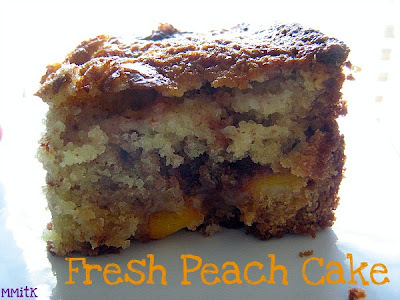 You layer the cake batter, sliced peaches and a cinnamon-sugar mixture and then bake the cake. The house smelled absolutely wonderful and we all enjoyed this summer-y breakfast! Two months ago, I had zucchini and summer squash coming out of my ears and now it is happening with the eggplant! This photo is not very pretty- I apologize, but if you look at the picture with the recipe, it looks quite a bit more appetizing. I had to share this one, even if the photo wasn't the greatest, because I had some helpers putting it together and because this is the first time that my son has actually LIKED eating eggplant. I will repeat that, just in case you didn't have the chance to process it. 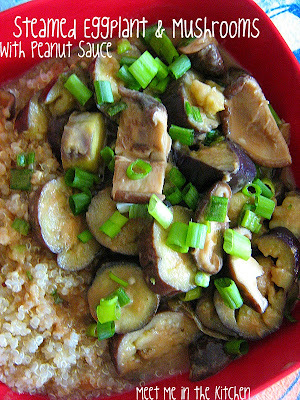 My son ENJOYED eating eggplant the night we made this. He consumed it with no complaints, no fake fainting, no tears, no endless questions of why must we eat this- he just ate it. And then he even said that he liked it. I couldn't believe it. It must have been the peanut sauce or the mushrooms- I don't know exactly, but I was so happy. So, if you have an eggplant hater in the house, this recipe might be the ticket to a happy night around the table. Oh, and I got so sidetracked about my son, that I forgot to mention that this dinner is also a good one for kids to help prepare because it is really simple and shows the technique of steaming veggies (I used my steamer basket) the the dressing is quick to measure and mix together. I saw these and couldn't resist making them. Unfortunately for me, it was during my month of not eating sugar, so I didn't get to try one. But, I took them to share at a large get-together and there were no leftovers, so I figure they must have been delicious! I am debating making them again, so I can actually try one, because they combine cornmeal and ground almonds in the crust, which sounds so yummy to me. 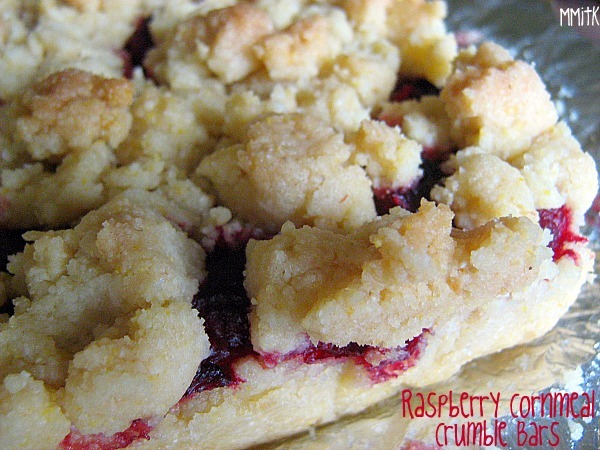 I love these types of bar cookies that have real fruit baked into them. The perfect way to use summer fruit, in my opinion. This Thai Summer Slaw from Cooking Light is summer perfection. 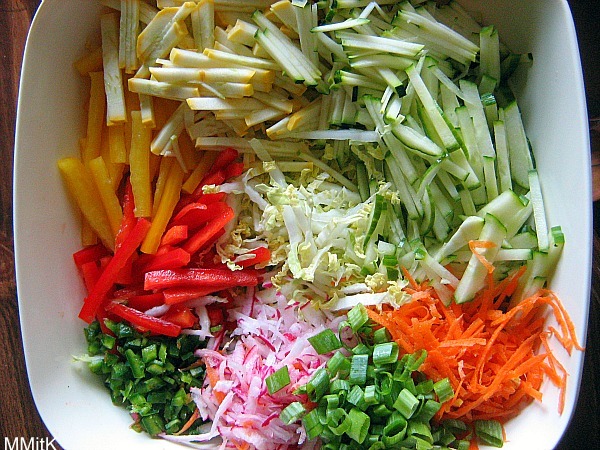 It combines napa cabbage, zucchini, yellow squash, cucumber, bell peppers, carrots, radishes, jalapeno, and green onions in a light, slightly spicy dressing. It is crunchy, flavorful and completely delicious. I was planning on making this for a potluck dinner that we were going to attend, but I forgot to buy a lime. I debated going ahead and making it with lemon juice instead, but I decided to wait, buy the lime and follow the recipe. I'm glad I waited! I don't think lemon would have given the dressing the right flavor. The day I was planning on making this for dinner, I prepped all the veggies (the photo above) and the dressing and kept them in the fridge until I was ready to serve it. Cutting all the veggies took a little bit of time, but getting that out of the way earlier in the day really made this a fast and easy dish to serve. I grilled some tuna steaks to serve along with it and it was a really great dinner. 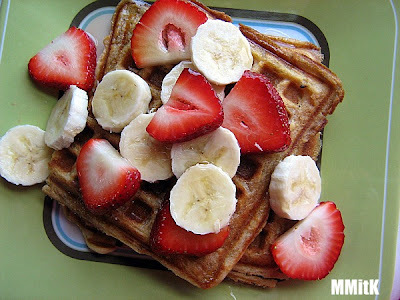 I made these waffles almost 2 months ago when my brother and sister were here visiting. I had spotted them before that, but wanted to wait until we had visitors to make them. My sister and brother both love peanut butter, so I knew they would be a welcome breakfast treat. These waffles were very tasty. The peanut butter flavor was noticeable, but not completely overwhelming. They were really good with bananas and strawberries on top. 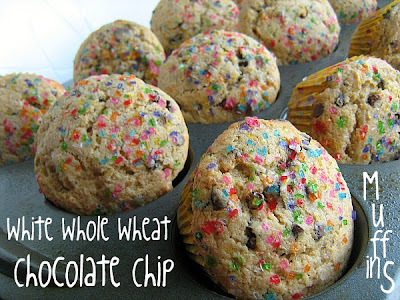 Now that school is back in session, I can't wait to make a big batch to have for breakfast on a school morning. Preheat waffle iron. If you want to make all of the waffles before serving, preheat oven to 275 F, set a wire rack inside of a rimmed baking sheet and pop in the oven. Whisk together the flour, sugar, baking powder, baking soda, and salt in a medium bowl. In your blender combine the melted butter and peanut butter, and blend until smooth. Add the buttermilk and eggs and blend to combine. Pour the wet ingredients from the blender over the dry ingredients and stir just until incorporated. I love growing swiss chard in my garden. It is so pretty and it has really done a great job producing lots of chard. I hadn't picked it for a couple of weeks, so when I went to harvest it, I ended up with more swiss chard than I have ever seen. I also had two whole wheat baguettes in the freezer that I wanted to thaw and use, so I somehow found this recipe and threw it together. I love these types of recipes because you don't have to follow them to a tee. You can sub different veggies, according to what you have on hand and the results are still fabulous. 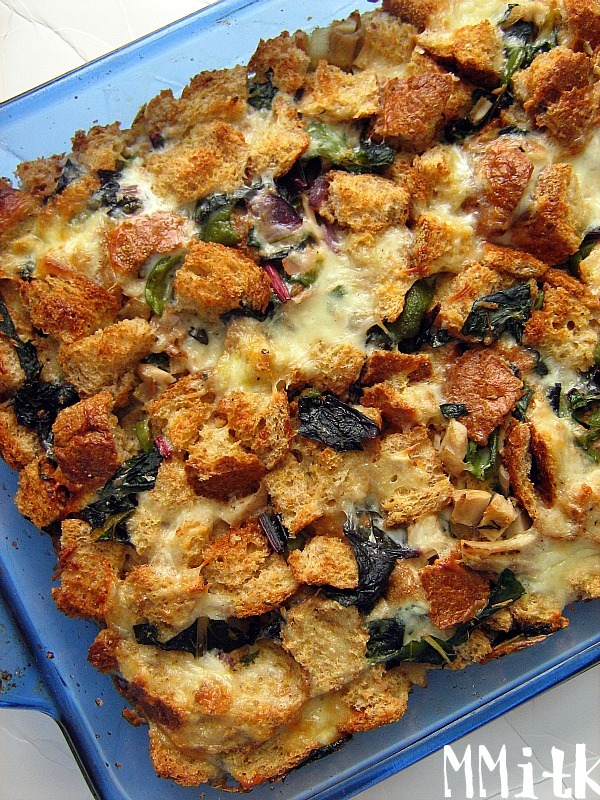 This was a really tasty strata that we all enjoyed. 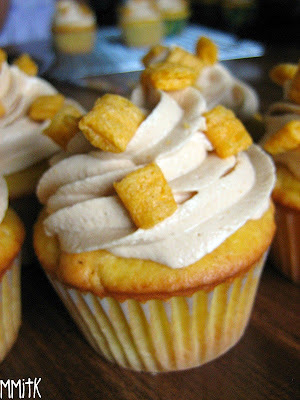 Why not finish out a snack/sweet week here on the blog with something totally decadent and crazy? 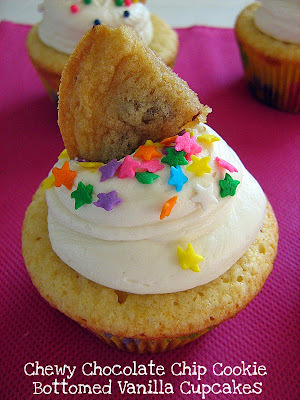 These cookie/cupcakes should do the trick. I made these for a dessert gathering and did not try them myself. My husband took the few remaining that were leftover to work the next day and his boss declared this the best dessert ever. 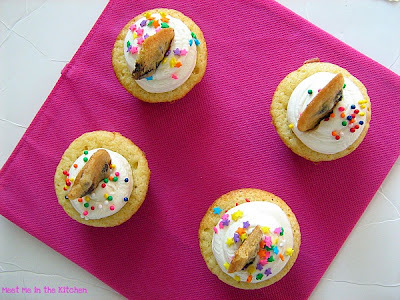 What could be better than combining chocolate chip cookies with vanilla cupcakes? 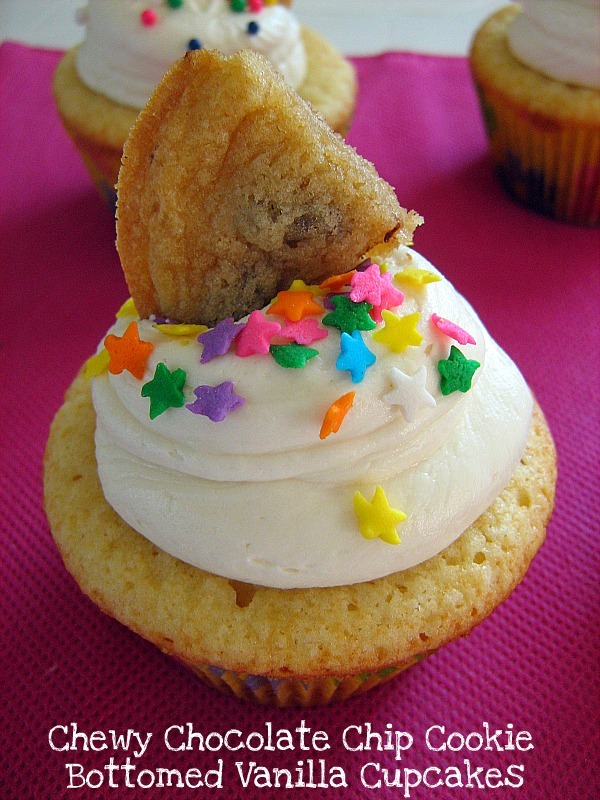 I don't know, but if you like those two things than I guess some fluffy frosting and a cookie on top just sweetens the whole deal. These were fun and enjoyed by everyone who tried them. Have a great weekend everybody! I have been meaning to make this ice cream for my husband for a long time. He loves chocolate chip cookies and I knew it would be something that he would love. I don't know why I put it off for so long, but finally, a couple of weeks ago, when we had some friends over for dinner, this ice cream was on the menu for dessert, along with this ice cream. 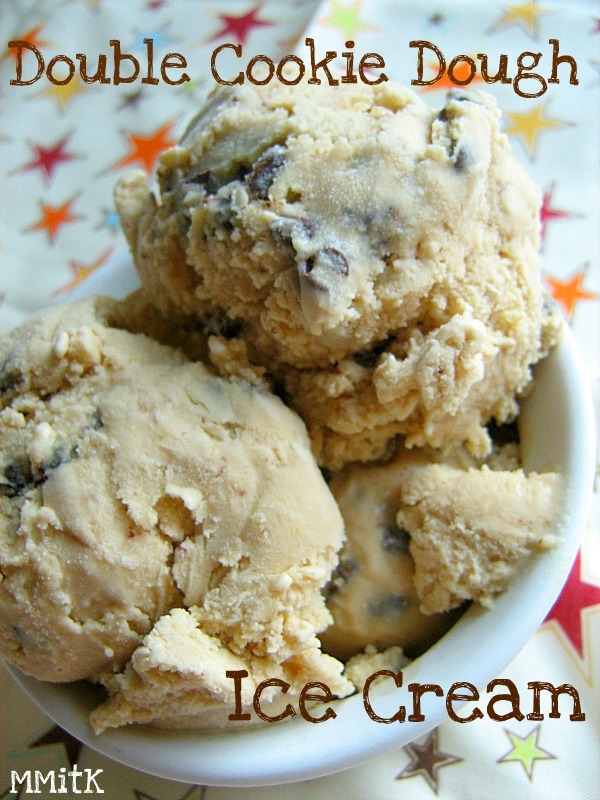 The reason this is double Cookie Dough Ice Cream is because the ice cream base tastes like cookie dough and there are chunks of chocolate chip cookie dough churned into the ice cream. This was very popular. It practically disappeared a few minutes after being served. Everyone raved and raved about it and I know that I will be making it again. 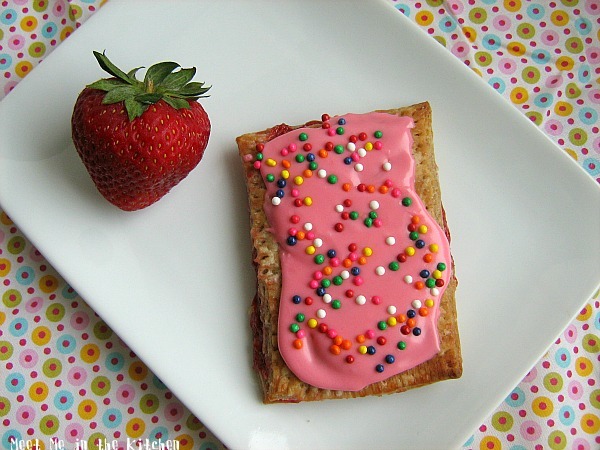 Pop Tarts. I remember using some of my own money when I was a kid to buy a pack of Frosted Strawberry Pop Tarts. My mom never, ever bought them and it was a treat to eat those things right out of the package. 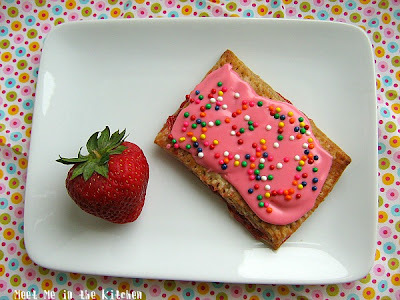 I have seen a ton of recipes floating around for Homemade Pop Tarts. I decided to make some when I realized I had some leftover whole wheat dough in the freezer from this crostada. 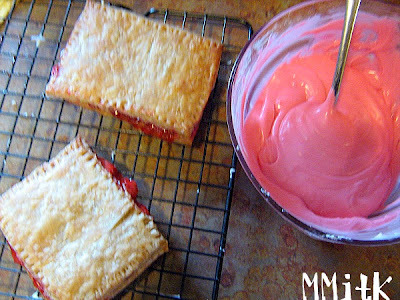 I had just enough dough to make 3 or 4 pop tarts. I decided to make a strawberry filling because for some reason, frosted strawberry poptarts are the most iconic to me. The filling was great and so was the dough, but the icing was way too sweet. All of my kids thought it was just too much, although the texture of the icing was perfect. These breakfast/dessert treats won't make an appearance very often in the kitchen, but it was a fun thing to try. Oh and if you live nearby- Happy first day of school!! Do you know what tomorrow is? Anybody??? It is the first day of school. I can't believe our summer is over already. It flew by and I'm not sure that I am ready for it to be over! I want more beach time, more sleeping in, more lazy days, and more fun in the sun! Well, the good news is that we can still go swimming if we want too and of course, school can be fun too. I just love summer and wish it could last all year round. One thing that will certainly make school fun is having a scrumptious muffin for breakfast every once in awhile. Most of the time I like to keep the muffins I make on the really healthy side. I want them to taste healthy and to not be mistaken for a cupcake. But, every once in awhile, you have to have a little chocolate or some sprinkles in there, to keep it exciting. 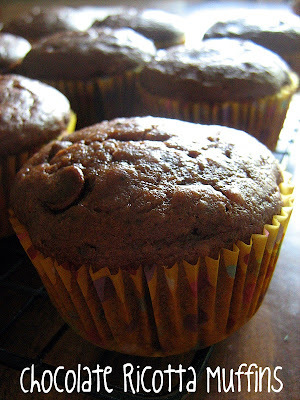 Both of these muffins are recipes that we made over the summer when we had a few friends joining us for breakfast. 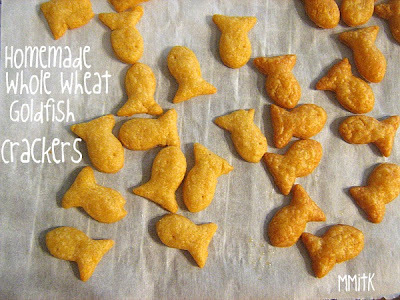 They are both tender, delicious and definitely kid-friendly. My kids will be more than happy when either one of these muffins shows up on a school day morning to make it just a little bit special. I've mentioned before that I don't really buy any sort of premade snacks. Since I like to spend time in the kitchen, I figure it must be possible to make anything that is out there for snacking, at home. My daughter asked me if we could make goldfish crackers and I knew that they had been made successfully by smitten kitchen, so I said of course! These crackers really couldn't be easier. 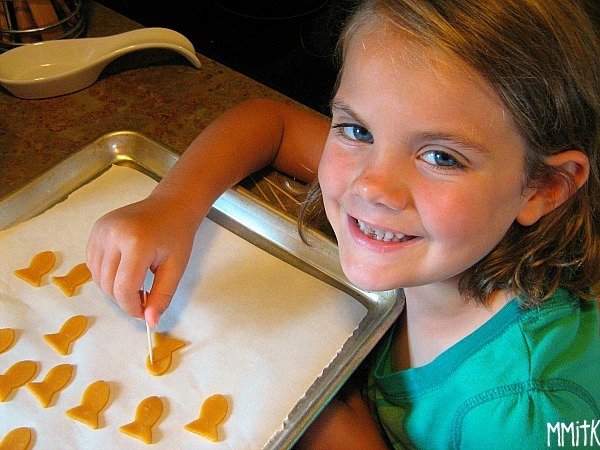 All you have to do is shred some cheese (which my kids love to do and I remember it being one of my favorite jobs when I was their age), put it in the food processor with a couple other ingredients, pulse until a dough forms, roll it out, cut out shapes or make it into squares and bake them up. I was really quite surprised at how easy this turned out to be. 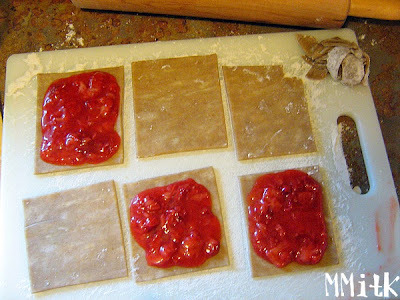 So easy in fact, that we made extra dough and have it in the freezer for the next time a craving hits. A couple of months ago I was asked to cater a luncheon for the Department Head of one of the schools at UGA. When I started planning my menu, I decided what dessert I wanted to make first and then planned the rest of the menu around that. 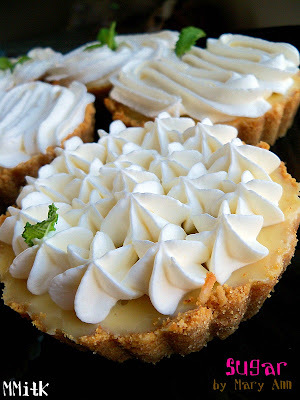 I saw these adorable Mini Key Lime Pies and I knew they would be the perfect summer treat and a great way to end any summer lunch. The main dish was this delicious salad which I have made many times before and since this event. 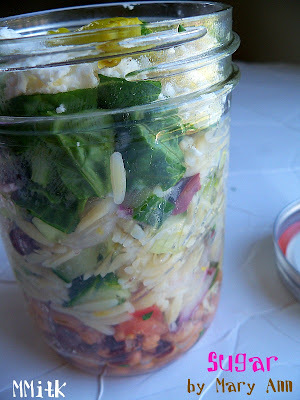 It is one of the best tasting salads and I love the cute presentation of each individual serving in mason jars. 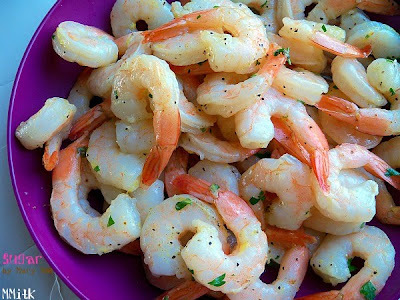 I can't ever go wrong with the simple roasted shrimp that my family loves, so I added that to the menu as well. The last thing I made was this wonderful Red Lentil dip that is served with pita chips. I remember when I first made it a couple years ago and it is seriously one of the best dips ever invented. The luncheon was an overwhelming success and I got wonderful, positive feedback. It was so much fun to organize, put together and present this meal. I love making delicious food and sharing it with other people. Last week my mother-in-law celebrated her birthday and of course we had to make her some sort of sweet treat to show our appreciation for all the love, care and help she gives our family. 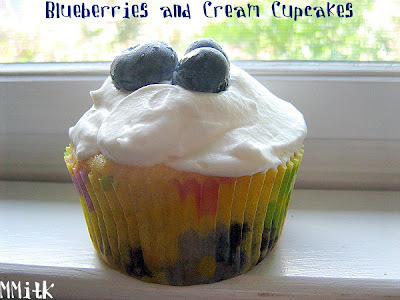 We had fresh blueberries and I found a light cupcake that seemed like the perfect thing for a summer day. My girls helped me whip these up and also taste tested them, just to be sure they were good enough to share! They were enjoyed by all who tasted them- perfect for a birthday or just any day that deserves a sweet treat. 1. Preheat oven to 350°F (175°C). Line standard or mini muffin tins with paper liners. 4. Divide batter evenly among lined cups, filling each three-quarters full. Bake, rotating tins halfway through, until pale golden, about 25 minutes for standard and 15 for mini. 5. Transfer tins to wire racks to cool completely before removing cupcakes. 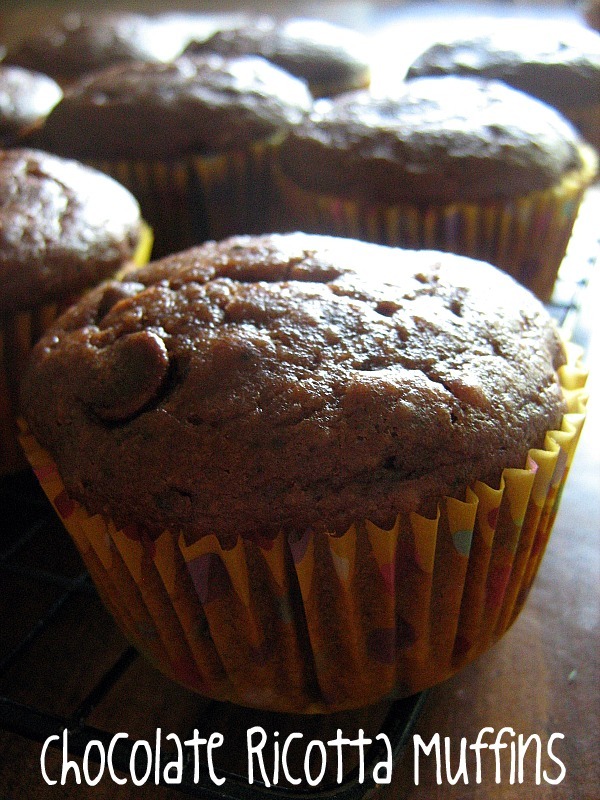 Cupcakes can be stored up to 3 days at room temperature in airtight containers. 1. Whisk heavy cream until soft peaks form. Add confectioners’ sugar, and whisk until combined. If not using immediately, whipped cream can be refrigerated, covered tightly, up to 3 hours in an airtight container. 2. 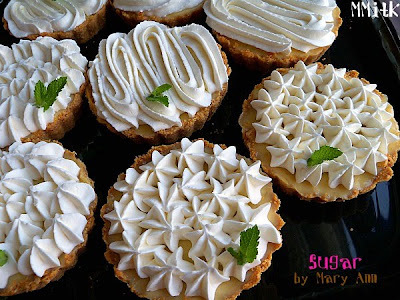 To finish, dollop cupcakes with whipped cream, and garnish with berries. Serve immediately. 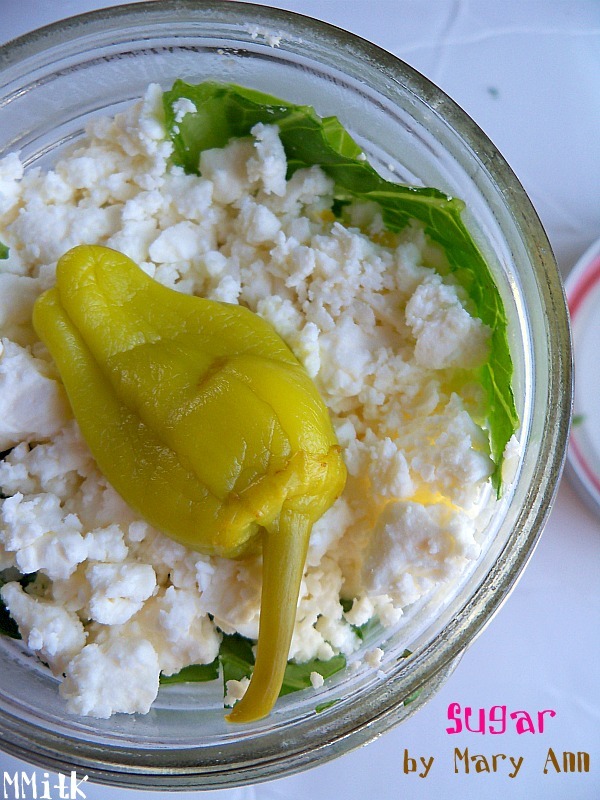 It's time for the Cooking Light Virtual Supper Club's Beachcomber Picnic! Val chose this month's theme and I would give anything to actually sit on the beach and eat this delicious menu today. It sure beats thinking about back to school shopping and the start of the school year that is right around the corner for us. and that leaves the dessert up to me, so I picked this Lemonade Layer Cake. I first made this cake quite a few years ago, for a baby shower. I remember it being such a hit with the crowd that my younger sister asked me to please make it for her next birthday. It was put in my memory bank, but I love to cook and bake so much, that I haven't revisited it since then. 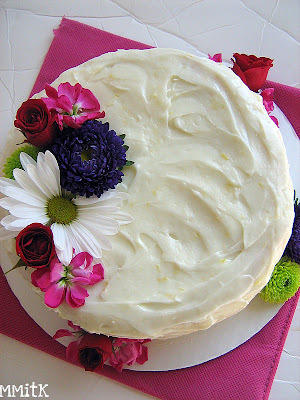 The cake and frosting both contain frozen lemonade concentrate (that is thawed before it is added in) and that really adds a great lemonade flavor that is very delicious and definitely noticeable. The cream cheese frosting is a perfect choice to top this cake. I decided to decorate it with fresh flowers since it is August and so many beautiful flowers are in bloom. It's really great when you can enjoy a slice of cake and you don't have to sacrifice any of the deliciousness just because it is a light recipe. This one is wonderful and the perfect way to end any picnic, whether you get to enjoy the beach or not. I love growing my own swiss chard. Nothing makes me happier than seeing those beautiful rainbow stalks in my garden. I have been really lucky this spring and summer- all of my chard has been doing great. No bugs, no problems. Usually I just quickly saute it or add it to whatever we happen to be eating. But, when I harvested it about a week ago, there was a ton of it and I wanted to do something bigger and better. 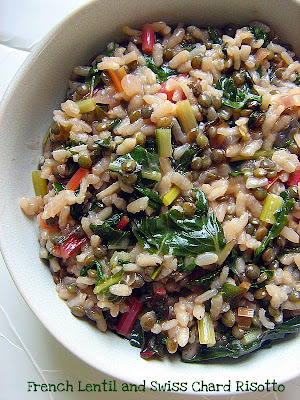 I found this recipe and knew it was perfect because it combines 3 of my most favorite things in the world- swiss chard, risotto, and lentils. I had just made chicken broth the weekend before I made this, so I had some of that on hand to use too. I know lots of people don't like cooking in the summer, but I find it really relaxing after a day of activities and swimming to be able to spend some time in the kitchen, making a delicious dinner. And this was delicious!